Sometimes Excel spreadsheets just don't cut it. A database will move you from static to dynamic. You will have more ways to analyze and evaluate your data in order to generate leads, pinpoint prospects and identify patterns in customer behavior. Whether you need a database that performs complex mathematical calculations or one that simply stores information in a logical, straightforward manner, Accessible Computing® has you covered. Our extensive database design and development experience means that we can do it all. Say goodbye to unwieldy stacks of papers and hello to a cutting edge system for storing, managing and retrieving information. No more hunting around to find the information you need. No more losing critical data. Call up exactly what you need in seconds with just a few clicks of your mouse. Save even more time by automating administrative tasks and updating your records in bulk. 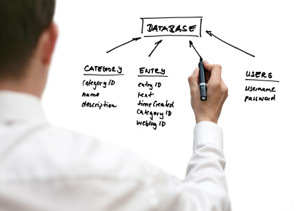 Our database design and development will make your information management easier than ever. A powerful database also improves communication among team members. Information sharing becomes a streamlined process, which means your employees will always have the data they need in order to excel at their job. A well-designed database will save you time and has the potential to increase your profits. Unsure of what type of database you need? No problem! Accessible Computing® offers expert guidance and advice on database design and development. Just fill out the Request for Information form to get started. We will begin by discussing the type of data you collect and data you'd like to start collecting in the future. Our years of experience with database design and development enable us to help clients uncover important relationships between data sets. All of this information is then used to design a structure for your database. Unlike a cabinet full of file folders, databases are intelligent. You can use your database to track relationships between multiple sets of data or generate lists of prospects. After all, your company's data is a goldmine. If you don't have a customized database, it's like trying to pan for gold with nothing but a plastic spoon. Your database will be able to perform complicated tasks, but it won't be complicated to use. A critical component of our database design and development is creating a backend management area that's simple and straightforward. Already have a database that you'd like to update and improve? We've got you covered there, too. Request more information today and learn how Accessible Computing® can populate your new database with the converted data from a legacy database. You won't lose any valuable data during a migration or conversion. You don't have to risk the integrity of your information in order to upgrade to a new database.